But I was most compelled by artistic director Laura Fried’s whipsmart, weekend-long curatorial subversion of the robotic takeover. In her introduction to Kim Gordon and Branden Joseph’s brilliant chat at the CenturyLink Field Event Center last Saturday, Fried called for the “cross-pollination” of disciplines through her Projects & Talks meta-agenda. These events entertainingly addressed commodification through dance, performance, video, and conversations rooted in educating audiences about art-historical interventions relevant to grim economic changes (i.e. unaffordable housing; corporatization) akin to those currently sweeping American cities with ultra-alarming speed and feeding our collective artistic anxiety. Seattle as a site for this matrix of discussion felt apt given Amazon’s occupation a few blocks up. On that note, Gordon and Joseph launched their discussion with how Gordon’s recent 303 Gallery exhibition, “The City Is A Garden,” riffed on the gentrification of New York via her use of the gallery (in part) as a “showroom” for cubic Astroturf hedges roughly alluding to Chelsea’s High Line, and, in this, how her Design Office initiatives playfully “aim to please,” poking at the ways “artists are in service to galleries.” Check. Left: Art historian Branden Joseph and artist Kim Gordon. Right: Artists Andrea Longacre-White and Brendan Fowler(right). The fair’s intelligent Projects & Talks series also included Brendan Fowler’s “durational performance”: His group reading of a poetic chronicle of singular punk memories celebrated collectivity, especially performed in a raw and fabulous storefront that controversially (to developers, at least) inhabits high-rent real-estate space in Seattle’s Pioneer Square. Flora Wiegmann’s Halo of Consciousness was a meditative two-woman dance (with Rebecca Bruno) inspired by Antoinism, spiritual transcendence, and reincarnation, staged in Seattle’s gorgeously refurbished former train station. Dawn Kasper’s Star Formation, an interactive environment mapped by cymbals that chimed as passersby triggered sensors, was cacophonously relaxing since only ten people were allowed in at once. Wynne Greenwood’s foam furniture, In Loving Memory, installed in a neighboring park for public use, created welcomed cushioning: a soft offering to allay hard-edged booth labyrinth burnout. Compared to these engaging and fun Projects, the VIP party at the Seattle Art Museum felt unneeded and a wee bit boring—get us back into the art! 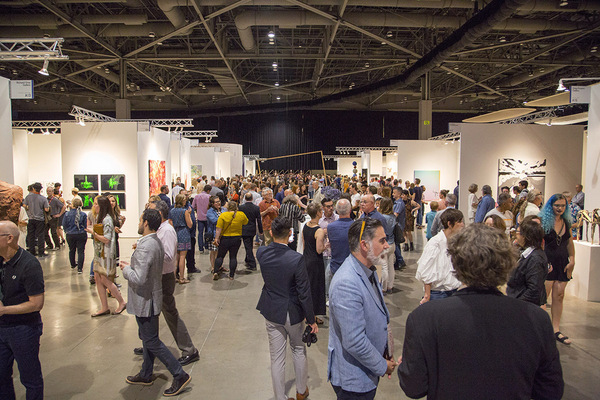 Paradoxically, these seemingly disparate Projects & Talks enhanced booth-viewing by encouraging chance encounters. Public Fiction’s impressive Middle Grays, Color Bars, and the comma in between was the only video installation in the fair, blasting a corner of the building with eleven short videos on multiple screens from the glory days of public-access television art, when on-the-air oddities could unfurl without being immediately stamped with corporate logos (or censorship, as evidenced by Google’s recent erasure of Dennis Cooper’s blog). TVTV, Laurie Anderson, Muntadas, and The Medium Is the Message aired in front of John Baldessari’sSix Colorful Inside Jobs, the “set piece” as Public Fiction’s Lauren Mackler called it in her insightful talk with Henry Museum curator Emily Zimmerman. In this, Mackler Skyped-in contributing artist Cally Spooner, who called for aggressively maintaining opportunities to “stumble across artwork,” “to meet artwork in unmediated ways,” for artwork that remains “marginal to main programming,” and for collectors to champion art that isn’t “overtly packaged.” Thank you Cally. Still, we might as well be honest: The hit was Carrie Brownstein’s conversation with Kyle MacLachlan, akaTwin Peaks’s AGENT COOPER. Yes, Agent Dale Cooper himself actually came to the fair to discuss such topics as Pacific Northwestern identity (“aw-shuckness style humility,” as Brownstein called it), David Lynch’s belief in the pine forest’s dark side, and how Portlandia furthers regional myth, depicting this corner of the country as a place where nature and artists can still semi-blissfully unite in unmediated, unpackaged bliss (with the help of legalized marijuana?). Seeing Yakima-born MacLachlan in his home state, talking articulately and hilariously with Brownstein about loving the wheat fields and the wine in Walla Walla, while committing one’s life to being a serious artist, was classic. Still, anxious undertones about cherished areas under siege filtered into their Q&A. “If Seattle is unaffordable for artists now,” one kid from the packed back row asked, “should we all move to Walla Walla where you are?” “No! Don’t!” MacLachlan replied, only half-joking. Brownstein intercepted generously with her answer, heroically calling on older artists to continue to find ways to support emerging artists in cities, regardless of how tough it becomes. Hopefully this nascent fair, only in its second year, will survive to support such innovative programming in the future. 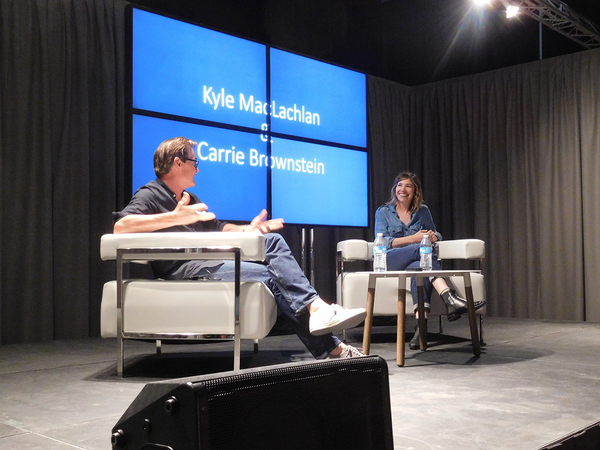 Kyle Maclachlan and Carrie Brownstein.